Priyanka is believed to have made a strong pitch to contest because she felt Modi was “bad for the country” and needed to be “stopped”. NEW DELHI: Imagine a Narendra Modi vs Priyanka Gandhi contest for the Varanasi Lok Sabha seat. It would have been the mother of all election battles, and would have put everything and everyone else in the shade. It would have electrified the nation and riveted the attention of the world. 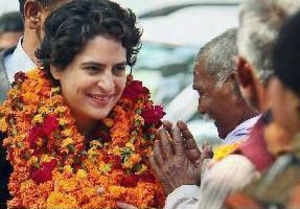 Priyanka Gandhi is reliably learned to have been very keen to be the Congress candidate in the holy city. But the party leadership finally decided against fielding her. Priyanka, who has so far limited her political responsibilities to managing her brother and mother's Lok Sabha campaigns in Rae Bareli and Amethi, is believed to have made a strong pitch to contest because she felt Modi was "bad for the country" and needed to be "stopped". Apart from perhaps tying up Modi in Varanasi and forcing him to curtail his national campaign, Priyanka's entry would have charged up the rank and file of the Congress at a time when a number of ministers and leaders were reluctant to fight elections of fear of losing (one senior Cabinet member is reported to have feared a rout). The fact that she was willing to place 'a higher principle' above a real risk of defeat would have sent out a strong and defiant message to the demoralized troops, and hopefully, the entire electorate, Congress insiders said. "Even if she'd lost, the results would have been only known after the elections. But it would have come as a huge booster before. It was very courageous of her. That's something senior Congressmen who've run away from contesting didn't understand," said a party manager. * Most of all, it would have diverted attention from Rahul and his campaign, and raised questions as to whether Priyanka's entry was an implicit acknowledgement of her brother's lacklustre leadership. There might have been some apprehension that Priyanka, by the force of her personality, would have greater gravitational pull than Rahul. She has been variously described by those who know her as "charming, charismatic and connected"; her political instincts are also said to be sharp, and she can work a crowd. The 41-year-old Priyanka's entry could have undermined Rahul's authority not long after he'd been officially anointed future leader. For Priyanka, who is said to be very close to her one-year-older brother, the reason for wanting to contest in Varanasi was never to position herself as an alternative to Rahul, but to "fight the good fight", according to an insider. "She has no larger ambition to lead the Congress," he added. Still, her desire to take the field against Modi is significant because it's in stark contrast to the continuing perception of Rahul being a reluctant politician, and because it shows that the younger sibling may not be averse to broadening her political interests behind the family boroughs of Rae Bareli and Amethi. For a long time now, there has been a subterranean demand, 'Priyanka lao, Congress bachao', which periodically finds public voice. One of the reasons the Congress delayed naming a candidate for Varanasi was because it was weighing the possibility of naming Priyanka. But the actual decision against fielding her was taken some days before Tuesday's announcement of local MLA Ajay Rai as candidate for the Congress; the last few days were spent seeking a tacit understanding with SP and BSP for complicating Modi's job in Varanasi. Significantly, early this month, in perhaps the strongest push yet for bringing Priyanka to the forefront of the Congress, party general secretary Janardan Dwivedi said that Rajiv Gandhi spoke to him about his daughter's political aptitude way back in 1990. The question is: Was Dwivedi aware of the secret confabulations and was he trying to test the waters? While promising to reveal details in due course, Dwivedi said, "As far as I know, her (Priyanka) interest in politics started at an early age. She was keen to understand political developments and the language of politics from the very start. I even have proof of this but I don't want to discuss it now. All I'll say is that Rajiv Gandhi told me something about this in 1990. That's all for the moment." The comment immediately led a group of Congress leaders to claim, off the record, that there were plans afoot to bring Priyanka into active politics. That plan has been shelved, at least for the moment. As for Rai's chances in Varanasi, even the boldest gambler is likely to think twice before placing a bet on him. But Priyanka is clearly still interested in Varanasi, even if she's not in the fight herself. At a meeting at the Tughlaq Lane residence of Rahul last Monday, Priyanka gave Rai a pep talk soon after the party decided to field him. "Priyankaji ne kaha ki aap jam kar ladiye. Unhone apna personal mobile number bhi diya aur kaha ki aapko jo bhi zaroorat hogi woh aap turant bolen. Woh aapko muhaiyya karayi jaayegi. (Priyankaji told me to fight wholeheartedly. She gave me her personal mobile number and told me not to hesitate to ask for anything that I may need and said I will be given every help)," Rai quoted her as telling him.